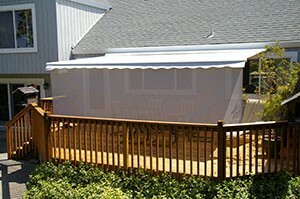 If you’re considering an awning for your deck or patio, Sunesta’s superior retractable awnings are a versatile choice. With the push of a button or turn of a handle, you can have sun when you want it and shade when you need it. Whatever activities you typically enjoy on your deck –reading, dining, entertaining guests, or anything else – you’ll be able to do so in the utmost comfort under your new Sunesta Awning. Every single one of our awnings is made to order, so no matter the size of the space you’re looking to cover, we’ll be able to ensure a perfect fit. Plus, our awning fabrics come in more than 180 striped and solid options, so you’ll be sure to find a style that complements the design of your home. We can customize an awning for your deck in as little as five days, so that you can start enjoying the benefits shortly after placing your order. The entire process is handled right here in our American manufacturing facility, allowing us to enforce stringent quality controls. Plus, a factory-trained installation team will make sure everything is put properly into place, ensuring that you’ll be able to enjoy your new awning worry-free for years to come. Ready to learn more about a Sunesta Awning for your deck or outdoor living space? Call 1-800-SUNESTA to get started.